Integrating body focused therapies and shamanic practices. "It was as if many, many different shaped objects were raining down into me and I thought immediately, here they are, my returning soul parts. It felt like a rare and precious gift." "In more than twenty years of consciously working towards healing I don’t think I have ever had such a powerful session.... Purdie quickly helped me to regain my strength by supporting me to break through some very deep-seated and embedded patterns..... After only a few sessions I began to experience very tangible shifts and could recognise the voice of this very powerful shamanic work." One of my greatest joys comes through sharing the magnificent consequence of this gift with others." INDIVIDUAL SESSIONS COMBINING: Process Based Therapies, Psychotherapeutic Tools and Shamanic Practices. 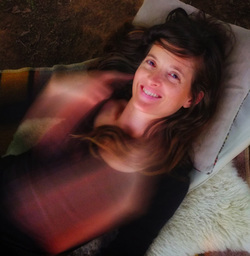 Purdie's work amalgamates a unique combination of body focused and psychotherapeutic approaches within a broader shamanic framework. She brings together her learning from the curanderismo and medicinal plants of the Peruvian Amazon with her experience in voice dialogue, visionary cranio sacral work, holistic pulsing, soul retrieval, gestalt therapy, sound as medicine and mental health first aid accreditation. This broad combination of training and depth of experience allows her the capacity to traverse through the emotional, psycho-spiritual, physical and energetic realms whilst supporting an integration between the many layers of each individuals experience. Purdie’s approach embraces both wild nature and biological knowledge and combines specific methods for discovering and investigating the soul’s hidden riches. Within this space takes place a border crossing into mystery in which to recover the innate gifts buried beneath the surface of our daily routines. Purdie has a strong experiential connection to the Curanderismo (healing arts) of Peru, she spent extensive periods of time living and training under a number of Curanderos (shamanic healers) in the Western desert and Amazon basin regions. It was during this time that she apprenticed to the natural realms, connecting to a greater wisdom through learning directly from specific plant and tree spirits. Their greater presence and knowledge imparted through traditional practices gave Purdie the profound understanding of inner pathways that informs both her group and individual session work. Her therapeutic framework has also been greatly influenced by her work, personally and professionally, with renowned Curandero Simon Green. As a mentor he has overseen and guided her development as a practitioner for many years. Purdie's most recent trainings with Hugh Milne the founder of visionary craneo sacral work and senior voice dialogue trainers Ana Barner & Peter Chown have also become integrated aspects of her treatment approach. As a director and co-founder of the Australian Sound Institute Purdie assists people to gain an in depth understanding of sound as a modality and to connect with their voice as a tool for self healing. She teaches one on one "Sound as Medicine" courses, facilitates group classes in intuitive voice practices and co-facilitates the "Bridgeweavers", a not for profit community group, working with the therapeutic use of sound and voice to support and nurture those touched by the profound experiences connected to new life and death. She also produces immersive sound events such as "The Long Song" - A journey in sound and performs with the three piece musical ensemble "Cave In The Sky". In both her individual and group facilitation she integrates the wisdom from the many renowned teachers with whom she has trained. These include Sandra Ingerman (Soul Retrieval), Simon Green (Huachumero), Ana Barner & Peter Chown (Voice dialogue), Hugh Milne (Visionary Craneo Sacral therapy), Tanya Lloydell (Gestalt therapy), Iolani Grace Negrin (Hawaiian temple bodywork), Terri Batten (Shamanic Journeying) and Sally McKern (Holistic Pulsing).